Furious Amazon Prime customers have complained after being forced to wait four days for deliveries when the service promises to have packages at your door in 48 hours. The online goods giant has received several complaints from customers who have signed up for its premium service Prime, which costs £79 a year, only to be left disappointed in the run up to Christmas. Amazon has recently been dogged by claims it threatens its drivers with £110 fines if they call in sick. The complaints about the missed delivery targets are now being considered by the advertising watchdog, who received 'a handful' of reports from people who had signed up to Prime. A spokesman for the Advertising Standards Authority told the Independent the complaints were being 'considered', but added that no official investigation had been opened at this stage. Amazon had previously told customers delivery times would vary because it is a busy time of year. Chris Styles, from the West Midlands, was expecting a present for his niece to be delivered in one day. It comes as some drivers claim they were forced to be available seven days a week and threatened with fines if they were ill, the Sunday Mirror reports. At least four drivers, who worked for Amazon transportation subcontractor UK Express, have brought claims to an employment tribunal that they were denied basic rights. A spokesman for Amazon said: 'We cannot comment on employment tribunal proceedings involving claims against an independent delivery company. Our delivery providers must abide by Amazon's Supplier Code of Conduct and we investigate any allegation that a delivery provider is not meeting our expectations. 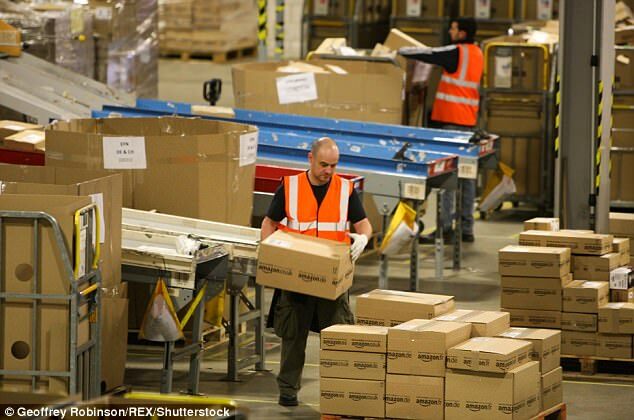 It was claimed last month that Amazon's staff are falling asleep on their feet and being taken away in ambulances as they struggle to meet warehouse targets. Cameras monitor every move as employees try to process up to 300 items an hour, it has been alleged. Screens remind them if they are falling short. Exhausted staff are said to cover clocks so they are not reminded how long there is to go on their shifts, and have to walk up to a third of a mile to use the toilet. The claims in a newspaper were made about the online retailer's newest warehouse – which the company refers to as a 'fulfilment centre' – in Tilbury, Essex. But the investigation, by an undercover reporter for the Sunday Mirror who spent five weeks there, suggested workers suffer mentally and physically as they try to meet demand. He said that some of his colleagues were so tired from working 55-hour weeks that they would 'sleep on their feet'. 'Those who could not keep up with the punishing targets faced the sack – and some who buckled under the strain had to be attended by ambulance crews,' he added. It comes at a time when Amazon has promised to improve the treatment of staff following accusations of poor conditions and low pay. Amazon said yesterday: 'Amazon provides a safe and positive workplace with competitive pay and benefits. We are proud to have created thousands of roles in our UK fulfilment centres. As with most companies, we expect a certain level of performance. 'Targets are based on previous performance achieved by our workers. Associates are evaluated over a long period of time.